We've made the iSearch (intelligent search) feature on MyProperty even more intelligent. It will now suggest the correct area on a search if you've made a spelling error. For example if you search for 'dynfern' it will suggest the correct 'Dainfern' for you. Click on the links to view the actual results in MyProperty. As you can see, it is a quite accurate! We've added a cool new feature to MyProperty's iSearch (intelligent search). You can now enter part of the area and it will highlight all possible matches as illustrated below. Don't forget to list your on show properties for this weekend - it attracts a lot of interest from visitors. 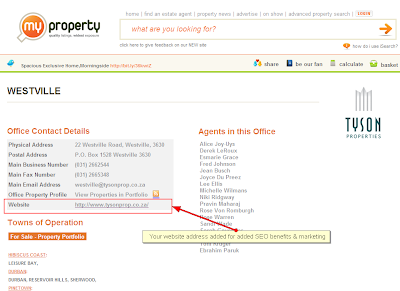 Your on show properties are automatically displayed on the MyProperty website - on show section. Currently we have 100-200 on show properties listed every week with the figure increasing. That's it, within a few minutes your listing will reflect as on show on the MyProperty website. Did you have any success marketing your listings as on show and getting walk-in's as a direct result from that? Please tell us on our Client Testimonial Form. Today we've moved all listings appearing under Cape Town/Hout Bay and Cape Town/Llandudno to Hout Bay/Hout Bay and Hout Bay/Llandudno. Since Hout Bay is a town on its own the incorrect suburbs under Cape Town were removed. Many people complained about the way the paging works on the new MyProperty website. It used AJAX technology to update only the listings displayed when clicking on the page numbers in the search results (and not the completed page). This resulted in visitors viewing a property say from page 5, when the click the back button in their browsers it jumped to page 1 of the search results - which is frustrating. We have the 'view property in new window' link but maybe that link wasn't too obvious. We've therefor changed it back to 'normal' web pages in favor of usability. On a technical note:This is one of my biggest frustrations with Ajax technology. Most people are used to using the back button in their browsers so your browsing history is completely lost. We are however busy figuring this one out - rest assured we will find a solution. 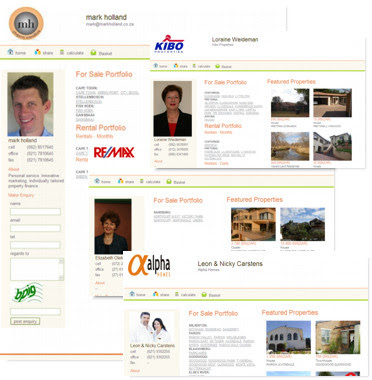 Your Agent portfolio website is like your own personal real estate website which is usefull if you don't already have one of Entegral's template or custom build websites. It features your profile (photo, logo, contact details and description), a contact form, featured property listings and links to all your listings per suburb and status. Great news today is that we are getting ready to launch the OMS GIS Explorer! The OMS GIS explorer allows automatic mapping of property listings on a Google Map. It furthermore has filter functionality to narrow down to a specific area, agent or property features (status, price, type etc). For our national clients this can for instance plot properties across the entire country for specific parameters you've set. The possibilities are endless. The GIS Explorer will be a great tool for agents and their clients to for instance identify matching listings per filter criteria and map location. 1. We've enabled your office website address on your office portfolio. This is pulled through from the OMS or from your feed if you use the OMS GRID import interface. This is a direct link to your website which will benefit your website SEO. If you don't have your own Entegral-build website check out www.entegral.net for details - it links with the OMS and is cost effective to run! 2. We've enabled AUCTIONS portfolio links on your profile. This will automatically compile a list of suburbs where you have auctions, with quick links for visitors. 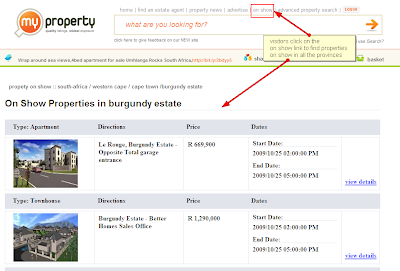 Tip: visitors can search for auction properties in MyProperty by simply searching with the auction keyword and area, e.g. 'cape town auction'. About the OMS property photo uploader The OMS allows you to load an unlimited number of photos to property listings. Best of all, you can select all your photos for a particular property listing to be uploaded at once - the system will automatically resize your photos! About the OMS news content editor: The OMS news editor (available through the Marketing & Content menu / external news) allows you to load your own news articles to your website (if hosted by us). The built-in document manager allows you to upload files (e.g. PDF's) you want to make available as a downloadable file on the article.